Out of all the many styles of cat furniture available to you, whether you are building or buying it, having a wall-mounted cat tree is necessary for your cat because it satisfies your cat’s natural needs in a safe way. Most other furniture like trees can be very unstable and when put in the center of the room like many people do, it doesn’t suit the cat while also opening up your home to potentially dangerous situations. If you live in a crowded apartment or small house, you are probably very familiar with how tight space can be. Add pets to the mix and things get pretty cramped real quick. 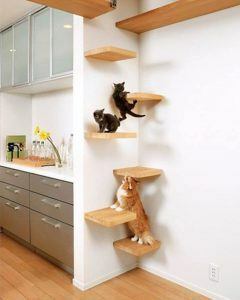 Getting a wall-mounted cat tree saves you a lot of space in comparison to free-standing ones that are large and bulky. By having the tree on the wall, it doesn’t take up any floor space at all! Additionally, it creates a win-win situation because by doing this you will also be increasing your cat’s comfort by expanding its territory. By giving it what it needs in this way, you fulfill its needs without having to sacrifice yours. It also offers increased territory in a sharing sense. If you have more than one cat and one of them does not like to share the windowsill, putting up a wall mounted tree structure is a great way for the other cat to get a good vantage point to see out the window as well. What’s even better is that you can build different levels to accommodate more cats and solve territorial problems leading to a happier household. One of the biggest issues with cats and furniture is scratching. We don’t pay hundreds or thousands of dollars for a nice piece of furniture to have our cats tear it to shreds. By giving your cat a wall-mounted tree that is equipped with scratching posts and materials, it gives them a more appropriate place to handle their business. Additionally, if you’re like me you might get a little frustrated when your couches and home in general start to be overrun by fur. Especially in the Spring when furry animals like cats shed their winter coats. By installing a wall mounted cat tree, most of the shed fur will be relocated to the structure instead of the tree. Your cat will likely enjoy the wall structure more because it’s off the ground and around the circumference of the room. This means that most of the shed fur will drop on it and all you will have to do is vacuum it up without even having to do much bending! Your cat is a predator by nature. You might not know it but your cat belongs to the Felidae family which includes pumas, tigers, leopards, lions, etc. When you look at most of these, they often prefer being on a high point like large rocks or trees. The same instincts apply to your cat as well. Being high up makes them feel safer and also puts them in control as they get a wider view of what’s below. It is also more comfortable for them to be up there than below because they can easily determine the level of unknown threats. In your home, this might be loosely interpreted by them as things like dogs, the vacuum cleaner, small children or any other parties while they are in safety. So another reason why your cat needs a wall-mounted cat tree is so you can satisfy its feline instincts to be off the ground which makes for a much happier cat. If you have a cat in your house, then chances are you know they are, well, a bit self-centered. I mean, they’re not a ‘please you’ driven and cuddly like dogs are. They are much more independent than dogs and as a result, only like to get attention when they actually want it. Most of the day they prefer to spend relaxing, undisturbed and untouched. When they are up on a wall-mounted structure, they are out of the way and in their own space where nothing can climb up to get them. In addition, cats are nocturnal animals. That means they like sleeping during the day and are active at night. You will find it more peaceful for your cat to be running over the cat tree instead of over you while you’re trying to sleep. We aren’t sure about the kind of relationship you and your cat have but one thing that we are certain about is that you wouldn’t want any kind of harm to come to it. That is why you should get one because it is much safer than free-standing trees. As we mentioned earlier, a lot of free-standing cat trees are wobbly and unstable. This is because they are cheaply made to sell fast. If one is not secured properly, it can easily fall over and crush your cat, other pets or other members of your household. With wall mounted cat shelves they are already well fixed to the wall and stay secure as long as used according to the user manual. As mentioned earlier, cats are naturally hunt driven. This means that, although very lazy animals, they NEED to be active at certain times during the day. So by creating an environment where they are able to jump, climb and scratch safely will do wonders for their health. If your cat does not get in the appropriate exercise its body needs it can experience a whole host of health problems from obesity to heart issues and more! By having wall mounted cat trees in your house it will encourage your cat to stay active which will prevent health problems. Physical health isn’t the only way you will be adding value to your cat’s health. You can also improve their mental health as well by creating a healthy environment for multiple cats to communicate, play and get along with each other even that means giving each other more space. Tired of the same old options at the furniture store and want something different, exciting and new? Try a wall-mounted cat tree! They are quite sleek, stylish and come in beautiful, neutral colors. These reasons are just the tip of the iceberg when it comes to reasons your cat needs a wall-mounted cat tree Having one or more of these structures in your home not only makes your furred animal happy but also creates a more comfortable, safe home for everyone else that is free of cat fur, less torn furniture, better décor and on top of it all keeps your fur baby and family safe. If you have questions, comments or other feedback, please leave them in the comments below. Hope this information has helped and if you know anyone else who will find value in this information, please do not hesitate to share with them also! Click here to learn more about the best wall mounted cat tree! 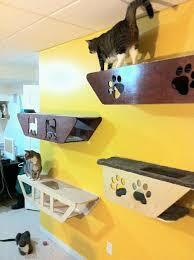 I like these wall mounted cat trees! What a great idea! I know cats like to climb, so I see them loving this. My son has a cat that has literally destroyed their furniture. This would be a great way to get her off the furniture and distracted into more fun things. I think it also kind of looks like an artwork. It could be made to look really pretty. I am going to share this with my son! Thanks for your feedback and comment. Yes, some of them are very beautifully designed. They really blend in with your living space so much that if one didn’t know, it could easily pass as regular decor.